What attractions would you like to see? What rides do you most want to see in this new water park? I'd recommend taking a look at ProSlide's incredibly range of water slide offerings if your inspiration is running dry. I for one would like to see a racing slide along the lines of Super 8 Aqua Racer, though obviously one of the newer concepts. I believe that the level of interactivity that rides like this bring make them some of the most enjoyable attractions out, and are one of the few that a family of any size can ride simultaneously. It's also time Australia got some new proper thrill slides. Something tall, fast, steep and downright scary. The distinction between a family slide and a thrill slide at our water parks is pretty much negligible these days, and I think it's unfortunate because the technology has changed significantly in recent years, making these styles of slides a fraction of the fuss they once were in terms of rider safety and comfort. I think a Lazy River is also crucial, especially implemented in such a way that it is a transport system within the park. Disney have proven that this concept works wonders and becomes a very good way to handle large crowds. With the amount of barefoot walking one does in a water park, it's also good to relax for a change. I want to see a water coaster or log flume where you get soaked with water cannons, foutains ect. Lots of themeing. A huge thrill slide like someone said above me. A wave pool, I love em'. The most fantastic ride I found when in Orlando last month was the new slide at WnW called "Disco H2O." Go and check it out but it was too fantastic for words. No matter what you've seen or read you are just not prepared for what you find in the main 'room' of the slide. It's pretty amusing that all that is going on in there. Just wondering how long people in the industry, ie. Wet'N'Wild, knew for sure that Dreamworld was going to develop a waterpark? When the media release was posted. To be honest, alot of people had already known about this for years before it was put into action, but by that stage these are all ideas or suggestions. Take B&M for example, they're coaters can take up to 4 years to go from planning into fruition. 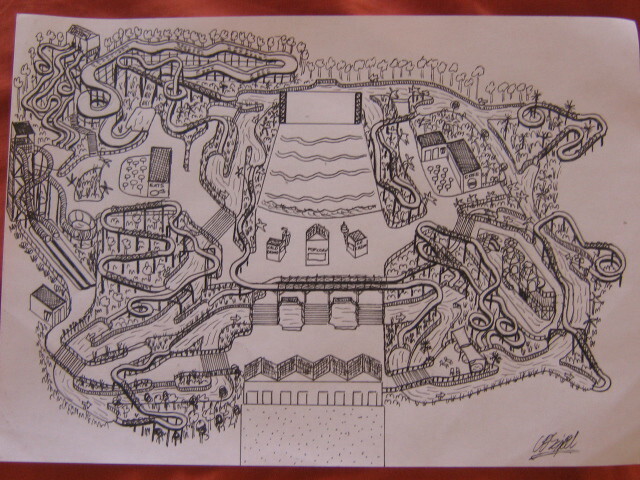 So in a forum full of theme park nuts, is this all the ideas there are? Yep, slack. As for me, I definitely wouldn't mind a water blaster... or whatever you call them (the waterslides that have uphill booster slopes etc.) One of those circulating the park with a nice big splashdown at the end would surely make my day. Having two stations is a good idea, except for the fact that the DWWP will have a seperate entry system to DW, meaning people could easily jump the fare to get in. Never the less the roller-soakers are definitely a good idea to have around a beach area, unless it's like Carowinds where they have it running over bland pathways and whatnot, basically ruining the fun of the ride. Now "that's" a fantastic idea. I would like one of those slide that WNW used to have next to the speed slide. Think it was twister or something like that. It was fully enclosed and each slide twisted over and under each other, but make it a much bigger version. As far as i know its still there. Ok, i thought they removed it ages ago. On the vekoma website, there is info on their newest coaster called the splash party, its fairly similar to the swing thing, but it has been developed in conjunction with White Water West. 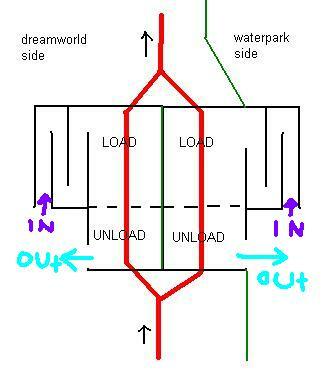 http://www.vekoma.com/ (Under Family Coasters) This could be a possiblity. 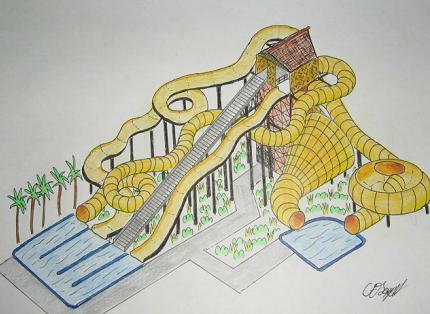 Another idea i thought of was a walk through type attraction (like tomb raider) But with water slides. Guests would walk through themed coridoors, with a few waterslides they go down on the way (with special effects) There could be multiple routes people could take and random water effects would spice up the ride. since dreamworld has announced the park will have attractions never before seen in Aus I think two waterslides it should have are: The waterslide bowl - I dont know if this is the right name but it looks like a skatebaord half pipe but its a waterslide The Funnel - Again I dont know if this is the right terminology but its the funnel type one where you spin around and around and drop through a hole in the middle I think these two waterslides look pretty cool and definitely not in Aus yet. Also I was reading a post about if amazons was better than WnW and they were saying generally not but I wouldnt know I never got the chance to to Amazons but one i thing I remember is that amazons had a waterslide that when you got to the end there was a huge drop from the end of the slide into the water that looked kind of fun but to this day havent seen one around can anyone comment if this was a good feature of the slide to have the dropoff and maybe something like this should go into dreamworld?? since dreamworld has announced the park will have attractions never before seen in Aus I think two waterslides it should have are: The waterslide bowl - I dont know if this is the right name but it looks like a skatebaord half pipe but its a waterslide The Funnel - Again I dont know if this is the right terminology but its the funnel type one where you spin around and around and drop through a hole in the middle I think these two waterslides look pretty cool and definitely not in Aus yet. Also I was reading a post about if amazons was better than WnW and they were saying generally not but I wouldnt know I never got the chance to to Amazons but one i thing I remember is that amazons had a waterslide that when you got to the end there was a huge drop from the end of the slide into the water that looked kind of fun but to this day havent seen one around can anyone comment if this was a good feature of the slide to have the dropoff and maybe something like this should go into dreamworld?? You've got the terminology mixed up but yeah i know what you are taking about, the proslide tornado is the one that looks like a giant cone on its side and you go up and down the walls like a halfpipe, except it is enclosed, this paticular slide is going into WnW in september this year. http://www.proslide.com/whatsnew/whatsnew.htm (fourth one down) other slide type is called a Pro bowl, it is the one that looks like a giant toilet bowl, where you slide in and spiral around, dropping out a hole in the middle. http://www.proslide.com/products/bodysliding.htm (scroll down the page) If this ride was put in you would be killing two birds with one stone since you get the drop off when you fall out the hole in the middle into the pool below. (like the slide at amazons) I agree, these two rides would be great additions but im unsure as to wether a tornado would be put in if wnw will already have one. Bear in mind that if you have read the Media Release, with the exception of the Wave pool, all the slides will be a new style never before seen in Australia, so if Wet 'n' Wild is getting a funnel waterslide, Dreamworld isn't. I think there is one like it at water world in denver.